I’m doing quite a lot of these random research posts just now…but there’s not a lot else to blog about. I’m spending my days writing and refreshing my inbox every 5 minutes. And so, onward! When I listened to the History of Magic podcast series, one of the episodes interviewed Paul Kieve, who did some work on the Harry Potter and the Prisoner of Azkaban film (hence the introduction by Daniel Radcliffe). Kieve mentioned that he had a book coming out, and so I picked it up as a starting point for my research on magicians. 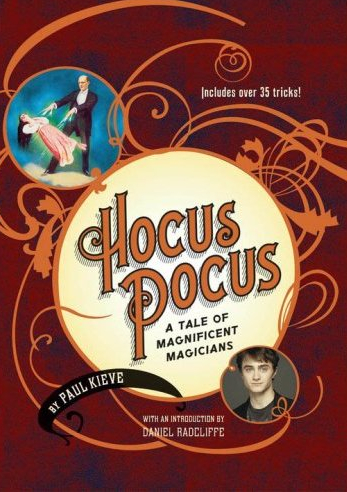 The book is targeted at MG kids, and is framed around Paul, as a young magician in the Egyptian theatre, interacting with the great magicians of the past, who come out of their posters that line his office. Each magician explains his past and discusses the tricks he was best known for. The book is also dotted with some simple tricks for readers to try on their own at home. It was a quick, delightful little read. The frame narrative made the book interesting and I could see it entrancing younger kids. From my other research into the history of magic, I came across so many instances of magicians seeing a travelling show when they were around 11-14, and that sparking their lifelong obsession with magic. However, once I worked my way into adult biographies of magicians, I did notice all the salacious details that Kieve understandably left out. Definitely recommended for the MG age group. Hi, I'm Laura Lam and I write speculative fiction. Upcoming books: False Hearts & Masquerade. Out now: Pantomime, Shadowplay & the Vestigial Tales.